Sandro Ivo Bartoli’s choice of Bach as a follow-up to his Liszt album for Solaire Records (review) may seem a little surprising, but these are pieces that he has kept close to his piano for decades, some even from his first days of learning as a child and becoming inspired at the instrument of which he would become such a notable master. 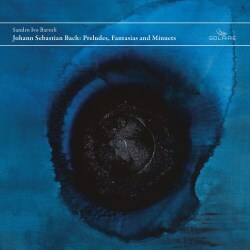 Producer Dirk Fischer writes, “I called Sandro early last year to ask him what he wanted to record as a follow-up to our Liszt recording, and without flinching for a single second, he said: Bach.” This idea developed into a programme that frames some of Bach’s least known miniatures between two of his most monumental works for the keyboard: The Prelude, Fugue and Allegro and the Chromatic Fantasia and Fugue. Bartoli further explains, “the reason for choosing these small pieces is simply that ever since I learned them as a little child, I’ve been in love with them, and from time to time, I played them for my own pleasure. I usually play very complex repertoire, lots of notes all the time. Going back to these little pieces by Johann Sebastian Bach gives me a chance to clear my head.” Of his interpretations his demands were as high as ever: “If I was going to record Bach, I at least wanted to make sure that I did not sound like anybody else. I made a conscious effort of not imitating someone. Glenn Gould in particular, because he’s inimitable.” If that photo of Bartoli recording Bach sitting low at the piano on a beer crate reminds us of Gould’s sawn-off chair then this is as far as that comparison need go, Bartoli being very much his own man in this repertoire. As is usual for Solaire, this CD is accompanied by a thick and glossy booklet, this time with extensive and thought-provoking notes by Sandro Ivo Bartoli and Tobias Fischer. Mention is made in the booklet about freedom when it comes to interpretation amongst these texts, and there is almost an emphasis on this as being a ‘moment’ recording: any other day and different things would no doubt have happened, and indeed on the same day as is reported: one of the little Preludes came out twice as fast on a second take and “it was better that way, so we left it.” The dubious authenticity of certain works as actual J.S. Bach originals is also broached, but ultimately set aside. What Bartoli does, for instance with the Fantasie of the Chromatische Fantasie und Fuge, makes clear use of the touch which makes his Liszt playing so special. There is an utmost respect for Bach’s notes, but they are also informed and enhanced by the experiences through which they have survived since being set down on paper three centuries ago. Bartoli is not afraid to give these pages an improvisatory feel, exploring dissonances and progressions as if feeling them out for a first time, working towards crucial points without over-egging transitions, and creating a convincing secular artistic narrative without pretentiousness. The Fuge is inevitably tighter, Bartoli playing at an easy pace and giving the voices enough character to create that sense of a musical conversation that Bach can do as few others. The playing here has clarity but is neither spiky or too softly lyrical – a journey of the intellect to oppose the intuitive nature of the Fantasie, a balance well found and an entirely satisfying end to this excellent disc. The smaller works are indeed framed by the largest on the programme, so we leap back to the opening Präludium, Fuge und Allegro BWV 998. Concluding with ebullience, this is a piece that Bartoli approaches with directness and relative simplicity, bringing out the open texture of the Präludium with the lightest of touches on the pedal and opening out the Fuge with a kind of wide-eyed wonder at the way Bach expands on his most simple of themes. Without going into every piece in detail, the heart of this programme is a delightful and fascinating traversal of less frequently heard pieces. Bartoli treads a fine line with the 6 Kleine Präludien, not over-emphasising substance where this is clearly not part of the nature of a piece, but extracting all of the goodness from within each jewel-like structure. There are little expressive lifts that are Bartoli’s own personal touches, contrasts in dynamic that add weight or create lightness. There is never a note too many in these pieces, and each is made to count as an individual while at the same time interlinked like the lines on an etching – those final cadences that moment where you stand back for a moment to view the results of fine and detailed craftsmanship. Similar things can be said of the 3 Minuets BWV 841-843, but here with a more flowing lyricism that invites imagery of more pastoral languor, or indeed a formal feel of almost galant dance patterns. The G minor Fantasy BWV 917 is of a different expressive order entirely. There is some remarkable music in this and the following two Präludium – Fantasie works that takes us to some surprising and forward-looking places. This is exploratory Bach both in creation and performance, and it has certainly made me sit up and take notice. The 12 Kleine Präludien is a hotbed of surprises if you don’t know them. If these are chips from the workman’s bench or maquettes then you already know that this particular workman is going to work them up into some pretty special finished pieces. Bartoli finds the delicacy or grandeur in each, conjuring their essence in the shortest timespan and pinning down that spark of originality that makes them stand apart. These are by no means the most profound of musical statements, but there is always a hook of some kind that keeps us listening closely, and Bartoli is a secure and knowledgeable guide. Adding the Präludium C-Dur BWV 904/a which is like the first of the Kleine Präludien is a nice touch, feeling a little like the return of the Aria in the Goldberg Variations. With excellent recorded sound and a superbly conceived programme this has been one of my favourite Bach piano releases of 2017.